ALBUQUERQUE, N.M. - April 12, 2019 - PRLog -- The Acre restaurant is holding out for a hero and they need your help. The Acre, located in Albuquerque's Northeast Heights is known for their Comfort Vegetarian cuisine. Their re-imagined classic comfort food dishes are delicious, hearty, and satisfying and made entirely from fresh, local produce. The seasonally changing menu is free of meat and processed meat substitutes and has been covered in the press by Eater, Albuquerque Journal, Local Flavor, Edible New Mexico, Albuquerque the Magazine, and many more. It's a healthier, animal-friendly, environmentally-responsible approach to food that Owner and Executive Chef Shawn Weed insists even carnivores are inspired to get behind. Now, The Acre is looking to pay some of that inspiration forward. This Mother's Day The Acre is looking for mother-figures who inspire through their seemingly super-human contributions. These SuperMoms might defy odds, give selflessly, fight courageously, brave the unknown, share wisdom, create opportunity, or inspire communities. 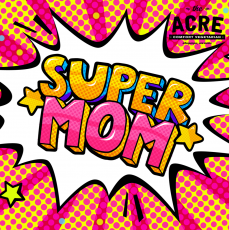 If you have or know a SuperMom, The Acre wants to know and celebrate her too. Share her story in 500 words or less for a chance to win a Mother's Day meal for four at The Acre. The Winning SuperMom will also receive a special plant-based spa gift and an opportunity to share her story through The Acre's social media channels. Submissions can be made on the event's Facebook messenger page at https://www.facebook.com/events/1232995306848933/ or emailed to contests@mymediatonic.com. The contest begins on Saturday, April 13, 2019. All entries must be received by 11:59pm on Tuesday, May 7, 2019 and must include submitter and winner's contact information including names, addresses, emails, and phone numbers. The winning submission will be notified on Thursday, May 9, 2019 or sooner and announced publicly on Friday, May 10, 2019 or sooner. The winner must be available on Mother's Day, Sunday, May 12, 2019 to redeem complimentary meal for four at The Acre's Mother's Day brunch or dinner seatings. For more information or to schedule a promotional interview, please contact Media Tonic.